Steve Gillmor mentioned the new release of Google Reader made available today. Now this is an online newsreader! Much more useable than the last version. Good job Google! I had mentioned in a post earlier this year that I have outsourced many of the tools that I use to third party vendors. Google Reader was one of the applications that I started using. Unfortunately, I’m not a big fan of the “river of news” type of newsreaders, and would rather see a list of sites that I can categorize under folders that I can check conveniently. When I was on Windows, I used FeedDemon after hearing about it from Todd Cochrane of Geek News Central and I really liked the application a lot. It was perfect for me. Since moving to the Mac though, I’ve been unable to find something as easy for me to use as FeedDemon, so I’ve just made due with Google Reader. That is, until I found Vienna. Vienna is an open source RSS news reader for the Apple Macintosh. It has a feature set comparable to Feed Demon. It also supports “Smart Folders”, which are a way of defining search criteria to automagically group posts based on filter criteria. The reader also supports tabbed browsing, using WebKit – really nice if you are looking for “continuity of experience” – not having to jump from app to app in order to finish a unit of work. I was able to pull my current subscriptions from Google Reader as an OPML file and import them straight into Vienna. No muss, no fuss. The application is very stable, I’ve found no bugs or issues that have gotten in my way since starting to use it a couple of weeks ago – and I find it much more to my liking than Google Reader was. I can look for specific site updates without scrolling all over the place or trying to figure out keyboard shortcuts. There are too many features to list here without being redundant, but their site has a list of the features included in the application, so check it out if your curious. The best part about Vienna is that the source code is available. If you don’t like something, you can tweak it. I’ve had a very positive experience with this news reader and recommend it highly to anyone looking for a news reader for Mac OS X.
Jake applied the latest update to his PSP last night and asked me what "RSS Channels" were, which gave me the opportunity to walk him through subscribing to podcasts. I have to say, I thought this was a pretty cool thing. 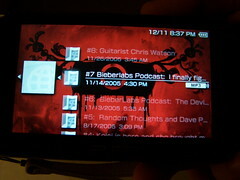 Pictured here is a view of his PSP subscribed to podcast.bieberlabs.com, which come to think of it, needs an update itself sometime. Over time, I’ve noticed that much of the traffic coming to the site these days is through the RSS Feeds. As I’ve noticed this traffic, I decided to finally break down and grab myself a copy of FeedDemon and lo and behold, I now do most of my reading through an RSS reader these days. Some of the feeds that I read actually aggregate del.icio.us links and Flickr feeds into the main RSS feed which I thought was really cool. It winds up that this is done through FeedBurner. So, with the help of the WordPress Feedburner Plugin by Steve Smith over at orderedlist.com, I’ve enhanced the RSS feeds on the site to use FeedBurner. I hope you RSS aggregators out there like the new feed. I’ve been using the Google Reader for the last few days since I’ve been away from my home machine, where I usually use FeedDemon for all of my RSS aggregating needs. I have to say, I’m digging it. One nice thing about having Google software to manage this kind of stuff is that they are confident enough to give you the ability to export your feed data to external feed readers if you aren’t happy with it. Joel Spolsky wrote an article back in 2000 about removing barriers to entry in order to get your product accepted in the market. One of these barriers is allowing the user the option to go back if they feel they have made a mistake. Google has removed this barrier to entry for us, allowing us to go back to what we are comfortable with if we want to. I’m not sure I’m going to go back. I really like what Google has done with their aggregator. Check it out and see if you don’t feel the same way. For a while I have wanted to be able to build RSS feeds off of the commit activity in a Subversion repository in order to publish the latest commits to an internal intranet site. I found a blog article called Base-Art / Bringing RSS to SVN this morning that makes this possible. From what the site says, this allows you to build the RSS feed in a post commit hook, in addition to building a separate HTML file for browsing independently from RSS, and does it all incrementally.